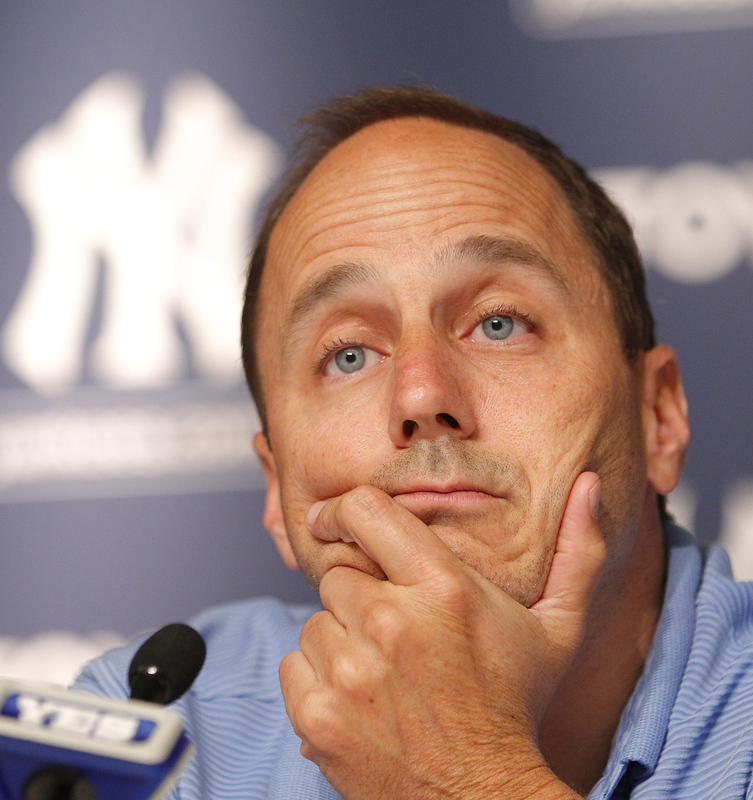 We’ve all heard it: The Yankees aren’t likely to be big spenders this offseason. Hearing this makes me chuckle as the Yankees have the dollars to field a $500 million pay roll if they wanted to, but their dedication to winning just hasn’t been there since the passing of good ole’ George. Sure little rumors have serviced here or there about them maybe pursuing Zach Greinke who has recently opted out of his contract with the Los Angeles Dodgers, but that move reeks of the move CC Sabathia pulled in opting out of his contract with the Yankees a few years back to simply restructure his contract and make a better payday. However, instances like CC Sabathia and Masahiro Tanaka are why I believe the Yankees aren’t going to shell out big money and a long term contract for a big name starter this year. There are simply too many factors that could explode in the Pinstripes’ face when giving a long contract to a starter as evidenced by Sabathia’s fall from grace both on and off the field and with Tanaka’s health issues which seem to have ultimately made him a two starter at best. For this reason, I couldn’t blame the Yankees for being hesitant to go after one of the “Big Four” (Greinke, Price, Cueto, and Zimmermann) starting pitchers who are available for the highest bidder this offseason. There’s simply too much risk involved. After all, Max Scherzer is a better starting pitcher than any of these four, save maybe Greinke, and the Yankees made no effort at all for him last year. I’m more than doubtful about pulling in a big name ace this year – through the free agent market. The trade market, however, provides a much better opportunity to acquire the ace that the Yankees so direly need in today’s revamped playoff season. Players can be acquired for prospects, whom are risks, for players of known talent, without necessarily having to be locked in to a big money or long term deal. As a result the Yankees should heavily explore this option to solidify their rotation with the #1 starter they’ve been missing the past few seasons. For whatever reason people seem to think we should get rid of our best player, Mark Teixeira, because he was injured in an unpreventable way by breaking his shin this offseason. Even “Yankee fan” Stephen A. Smith, whom it is irresponsible to let talk about anything on TV, called him out the other day. What people like this don’t understand is that Mark Teixeira was the best Yankee player offensively and defensively though he only played 111 games due to the fact his fractured his shin on a foul ball. If anyone else would like to try and play first base on a fractured shin, please contact the Yankee front office for a try out. These numbers should strike you as pretty impressive. Teixeira was for the most part equal or better in these categories despite only playing 111 games while the others listed here played at least 148. The point? Teixeira is doing exactly what he’s paid to do: Hit well and play astounding first base, which saved the Yankees dozens of errors this season. As a result, Teixeira isn’t going anywhere. He’s told the media that he’s going to retire in Pinstripes so there goes any chance you thought there may be at waiving his no trade clause. If Teixeira puts up elite numbers again next year like he did this, he will likely be tendered a qualifying offer, which I believe he would accept and would be ecstatic at this idea. I would take it one step farther and try and lock him down for two more years until first basemen like Eric Hosmer and Brandon Belt his the free agent market. You can get your replacement to Teixeira there. Greg Big played a nice little game of fill in while Tex was out hurt, but he still never came close to emulating said first baseman’s numbers and we missed having the switch hitting slugger, especially in the Wild Card game where our offense was nonexistent. Still Bird’s numbers weren’t bad and this could lead to him becoming a very valuable trade chip in acquiring a starter to anchor the Yankees rotation this offseason. After all, Teixeira has proven that he can play well with age and that we don’t need Bird anytime soon. I was surprised to see Carlos Carrasco back on the scene this year after breaking into the big leagues with some success in 2010 before ultimately disappearing into the minors for throwing at batters and poor performance and then succumbing to the TJ epidemic that is sweeping through major league baseball. Carrasco came back with fire this year and was as good and composed as ever. 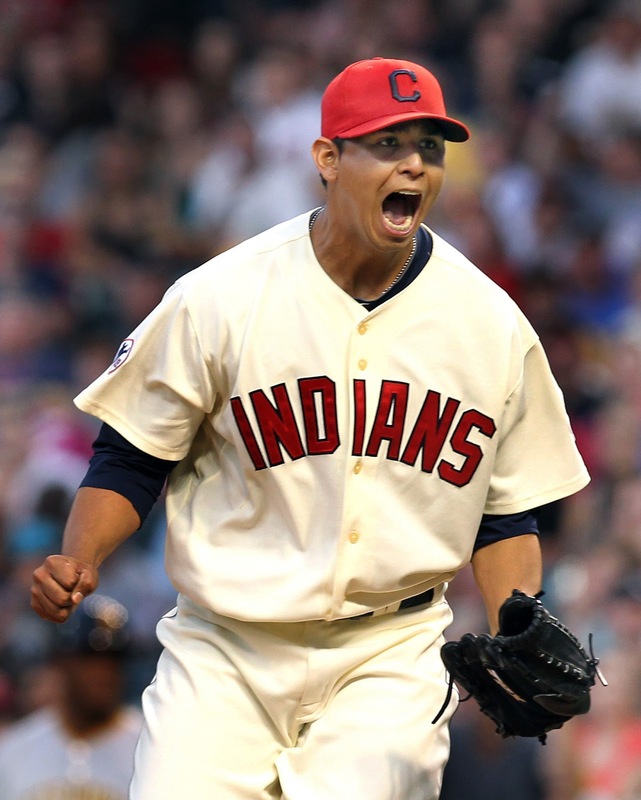 Carrasco took multiple no hit bids late into games and ultimately wound up throwing three complete games and a shutout en route to a season of a 3.63 ERA, 183.2 IP, and 216 strikeouts. The 3.63 ERA, while not bad, still isn’t done proper justice as is FIP registered at an astounding 2.84. I would also like to present a table comparing Carrasco this year to others in the league in the strikeout category. Obviously strikeouts aren’t everything, but you would like your pitchers to be able to get them when they need to and Carrasco has certainly proven he can. The numbers don’t lie and the desire to acquire Carrasco should be self-explanatory. So would the Indians deal him? We heard at the deadline this year that they indeed were willing to move him for the right price, but obviously nobody was able to fit whatever it was. We also know that last year they acquired Brandon Moss from the Oakland Athletics – a slugging left-handed first basemen. Greg bird tentatively fits that mold with more on the batting average side and less on the power side, but after seeing Moss put up just a .226 average and 19 home runs, the young Bird would figure to be a huge upgrade, especially compared to incumbent first baseman Carlos Santana who really can’t play defense anywhere and is coming off a relatively poor offensive year to boot. Simply put I believe the Indians would have real interest in acquiring Bird if given the opportunity it. The Indians get a blue chip prospect that really fits the mold of a player they need in Greg Bird while also getting Ivan Nova and Bryan Mitchell who have been inconsistent, but whose upside could still provide value to the Indians by replacing Carrasco in the rotation or bullpen. Ideally for the Indians, Nova would be a solid 3/4 starter, Mitchell a solid reliever, and Bird a star first baseman. That would be worth relinquishing control of Carrasco for. On the Yankee side you get a 1/2 starter who specializes in the strikeout without giving up much. With Teixeira providing elite production at first base, the loss of Bird won’t hurt. The Yankees have a plethora of back end rotation starters like Nova and Mitchell and as a result trading them also wouldn’t hurt. A rotation of Carrasco, Tanaka, Severino, Pineda, and Eovaldi (obviously there could be variation on the back end here) would look pretty good going into 2016. Ross is another starter whose name surfaced in trade rumors at the deadline this year. Two years in a row now Ross has posted at least 195 innings pitched and strikeouts – that’s pretty dang good. Of course it’s worth noting he pitches his home games in the spacious Petco Park, but Ross gave up half as many home runs as Carrasco. The biggest roadblock here is Padre management which pulled out of multiple trades with teams at the deadline, including the Yankees last year because they thought they could still contend despite being way out of it. It’ll probably take a higher price or taking on players with big contracts to get Ross away from the Padres. The Padres would hate to get rid of Ross I’m sure, but they couldn’t turn down an opportunity to take on such a package while also relieving themselves of Kimbrel’s salary. I applaud the organization for trying to turn things around so quickly last offseason, but it failed and it’s time for them to replenish the farm system they emptied and this trade would do so for them. Bird and Sanchez offer cornerstone power pieces for the franchise and Pineda would surely benefit from a move to Yankee Stadium into Petco Park. Mateo was infamously desired by the Padres in a deal for Craig Kimbrel last year and I’m sure they would still demand him in a package. UPDATE 11/18/15: The Padres have traded Kimbrel to the dreaded rival Red Sox, thus the above description doesn't apply as far as Kimbrel is concerned. 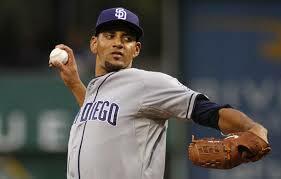 However, the Padres almost certainly would be interested in more pieces to build around and Gary Sanchez, Ivan Nova, and Jorge Mateo would offer an interesting package of upside to help the rebuild in exchange for Tyson Ross. For the Yankees I love this deal if for no other reason is gets under the skin of prospect huggers and penny pinchers alike. It would be a huge way to boost the Yankees rotation by adding a young ace and strengthening an already incredibly good Yankee bullpen. Miller, Betances, Kimbrel, Wilson, and Warren would undoubtedly be the best bullpen in the league and help relieve the rotation as soon as the 6th inning. We’ve already discussed why the Yankees can afford giving up Bird, but with JR Murphy looking better each year, the Yankees can safely trade Sanchez away with McCann and Murphy holding down the catcher slot for the foreseeable future. Pineda has been wildly inconsistent and the Yankees should welcome an opportunity to turn him into a consistency like Ross. Mateo is a speedster for sure, but that speed is all dependent on him being able to get on base at the big league level and that’s a big gamble to wait and see if it happens. It wouldn’t be a Yankee trade rumor article without mentioning a stud pitcher in the league would it? The Athletics are in shambles right now. Just a year removed from yearly playoff appearances, the Athletics ended up taking home the worst team in the AL crown in 2015. They notoriously went “all in” last year and failed. The result was a massive sell of both last offseason and this year in which they got rid of virtually every good player they had – except for Sonny Gray. At just age 25, Gray turned into a wonderful season posting a 2.73 ERA in 208.0 innings which was good for a star level 148 ERA+. 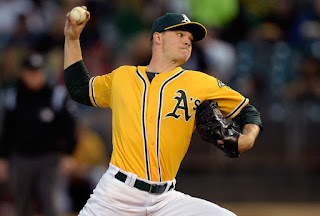 Billy Beane likes to sell for prospects and with the Athletics many years away from contending again, it might be a good idea to sell incredibly high on Sonny Gray (earliest free agent eligibility is 2020) and bolster the prospect squad they have that will hit however many years in the future. This is a situation where the Yankees should go to the Athletics with a list of 10 names and say “pick five.” Obviously Bird and Sanchez are top hitting prospects and the Athletics have needs at just about every position on their team. Heathcott didn’t look to shabby in the Bigs this year and would be a good outfield chip for the Athletics. He’s been top prospect material his whole career, injuries have simply slowed him down, not lack of talent. Pineda can obviously be inconsistent, but would probably be more consistent in a bigger ball park in Oakland and wouldn’t be the worst guy to replace Gray in the rotation. The Athletics, already getting so much in this deal, would likely be content with taking the dice roll on Mateo – and if he turned out for them that would just be a bonus. The Athletics got less than this for Donaldson, whom will likely be 1st or 2nd in the AL MVP vote this year. On the Yankee side I again, will ruffle the feathers of our beloved prospect huggers, but not necessarily penny pinchers. An arguement could be made that Gray is a top 10 pitcher in the league and will make well below top 10 pitcher salary until 2020, which would be huge for the Yankees. After all, they're trying to stay away from paying big amounts of money to starting pitchers over many years, and in Gray's case, they'll be getting an ace pitcher for a bargain until 2020. We've discussed why giving up these players is far from the end of the world, especially in Gray's case. I can't emphasize enough how huge it would be for the team to acquired Gray for the combination of talent and financial savings in his case. There are certain players worth giant packages like this and it would worth trading for Gray to slot him in the rotation next to Tanaka and Severino. THEY AREN'T TRADING BIRD PERIOD IDIOT!!!! Tex and Gardner will get traded though. Put Tex in their instead of Bird and you have something. Tex has a no-trade clause and is adamant that he's finishing his career as a Yankee, so I doubt he gets traded. He'll be in pinstripes while Bird will be in Scranton. Not even a week ago Tex was reported to have said that he is open to a trade. Also Mateo had a stellar season and will start cracking top 100 lists. Apparently, you don't keep up with the latest news like you should. Also Beane has been said to have liked Refsnyder. So, any trade for Gray would have to include him. Trading Pineda now would be selling very low on him. He will be affordable next year and should be given a chance to rebound. I agree with you that trading Bird is doubtful. But Tex provides something to the club that the Yankees need for the next years until he retires. Losing players soon like A-Rod and (the not so strong 2015 player) CC will make the Yankees use their veteran players to their advantage to hopefull get number 28. 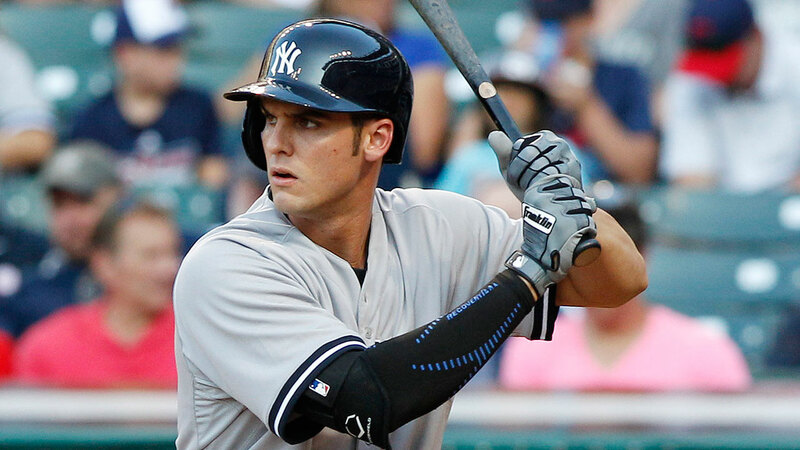 After this time the Yanks need young prospects like Greg Bird to attempt to fill in roles to become all star players. But like this article said the Yankees can possibly get players like Eric Hosmer who can contribute defensively and offensively. But still Teixeira needs to stay a Yankee for as long as possible. If your not going to trade Judge or Severino, you are not going to get Carrasco or Ross. It might take Judge and Severino to get Grey, plus a throw in. I like all these trade options. Bird is not going to be another Don Mattingly. We can look elsewhere for a 1B. A controllable starter will be key. And I do not see Boston or Minnesota coming with similar packcages. Yanks have no prospects in MLB top 100. Preller & Beane are too smart to make any of these trades. To get Kimbrel the Yanks would have to take back Upton (33MM 2 yrs) and or Shields toxic contracts. Forget Grey, Beane will play any offer to Red Sox who have a group of a dozen highly rated prospects to put a better package together. ... the Yanks have two players in the MLB Top 100 list in Judge and Mateo ... and with Sanchez's performance this summer that will be three Yankees in the MLB Top 100 ... and let's not forget that Severino and Bird were also on that list but have since moved on to greener pastures. five Yankee youngsters that can be used as trade chips, ammunition in the Bronx, or be placed in a holding pattern. not too shabby considering the state of the Empire's minors the last few years. These trades are a joke. The Yankees would be giving up waaaaay too much! Let's get serious. You are listening to the NY media too much. None off these players are rated in MLB top 100 prospects. If you go to a deeper list like scountingbook.com only Bird at 110 is in the top 200. The only way the Yanks get better is $$$$$$. Chris Sale would be a great lefty ace !! I don't think you can look at Tex as anything close to a sure thing. He had one great month and two good months this year. He was well below average pretty much every other month over the last 3 years. I wouldn't trade Bird for a pitcher unless it was a number one starter. the problem over the last three years is that the team seems to get its' pitching in order and then its' offense tanks ... or the offense gets going and the pitching starts falling out of whack. i swear baseball is at least equal parts luck and talent. the last season the Sox won it all, they had lady luck on their side. there is no way they were that good, seriously. yes, i hate them but that is not what is driving this sentiment. they were 50% talented and 50% lucky. the Mets sweeping the Cubbies this year ... come on ... play that series 100 more times and there is no way they sweep and probably more often then not will lose. again, a Met hater yes but it is not what is driving the sentiment. the Yankees were good enough this year to play deeper into October but they just did not have lady luck on their side. Tex's freak injury, coupled with Evoldi's elbow, coupled with an insane amount of 'good luck' for the Blue Jays and kaboom. maybe baseball is the true game of inches. i agree jays had best O hands down, hands up, hands all around ... but that couldn't get them past KC ... the jays had the Yankees number this year ... those two series in the Bronx, the latter being the doubleheader just brain-ducked the Yanks ... they were never going to the beat the jays after that. if nothing changes next season and the team comes back in its current form i think some small adjustments from within ... 1. Ellsbury plays to the back of his baseball card, 2. Gardner plays both halves of baseball, 3. Tex doesn't get injured, 4. and Pineda evens out his performances, will push the team further into October. those adjustments are not unreasonable to assume. as for the the rest of the team -- ARod, Beltran, McCann, Didi, Headly (minus the errors), Murphy, Evoldi, Tanaka, Miller, Betances - they need to do exactly what they did before. if we want to be greedy about it all ... 1. add a right handed bat either to everyday lineup (2nd base/free agent? outfield/trade?) or to the bench, 2. one more top 3 starter via trade, 3. and one more right handed arm for the bullpen. Assuming Pineda can find consistency is much bigger ask than you suggest. I don't think we can assume ARod and McCann will match their performance from this year either. The guy who does excite me though is Didi - imagine a full year of the guy who played from Jun - Sept. Not impossible we can finally have a guy hit over .300 for the year. A full season of the new and improved Eovaldi could be great too. Two amazing pick-ups by Cashman last off season - don't get nearly the credit they diserved. Pineda has shown enough to NOT be counted on to stay healthy. Tex 1yr 22.5MM ARod 2yrs 40 MM, Beltran 1yr 15 MM & McCann due to age are more likely to decline than stay the same. I agree that Didi gives them great D with enough offense to be a real asset. The only way to make a real playoff run is to ignore the big contracts and spend even more. If they trade the prospects they have the roster will get worse. I don't agree with your trade suggestions but I do agree that the Yankees will look to trade for starting pitching this winter. I think we need to aim high though and not go for a 'buy low' option. Someone like Carrasco has potential but we have a rotation full of guys we are hoping can finally put it all together. It is time to trade for a guy who has it together. Sonny Gray, Chris Sale or Chris Archer are my dream fits but I know they are all long shots. I also agree that Pineda and Bird should be available in trades. Bird's trade value might never be higher and Pineda is never going to put together a full consistent season. We should move him now while he still has value. You included Nova in some of your trades and while I would have no problem parting with him I think his value is close to zero right now. Probably best to hold onto him and see if he can put together decent run. My big suggestion for the rotation will sound crazy to some people, but CC's contract is a sunk cost. What we should do is consider how to get the most value from him. He had a decent run towards the end of the season but we've spent the last 2 years handing him the ball and hoping to still be in the game after 5 innings. Why not try him in the bullpen? It would be a tough blow for a vet like him, but he destroys left handers and in shorter outings where he isn't protecting his knee maybe he could add a few ticks to his FB and go after righties too. Worth a shot I think because right now he is doesn't deserve to take a rotation spot from Tanaka, Pineda, Eovaldi, Severino or Warren. If we can add a starter through trade or even sign someone like Kazmir (I know he had some issues down the stretch but I still like him and he won't need a long term deal) then CC just keeps dropping down the depth chart. The bullpen could really benefit form having him though if he can even be a great lefty specialist. Improve the rotation by giving his spot to Severino and improve the bullpen by adding a great middle innings/ lefty specialist guy. It won't happen I know, but it should. a better trade target is Carlos Rodon. the Yankees probably WILL acquire a big-name free agent starter. These trades are just silly Bird is not the center piece of a trade that get you an ace. Wonderful! So simple. I think it could also be useful for everyone to know how and where to merge documents online. I am sure at least once in your life you had to merge some documents. I use a simple service http://goo.gl/Ms4ebj for docs merging. It definitely makes my life easier!